You are looking at a SILVER medal for the Coronation of Tsar Alexander III. The Medal was established on November 3, 1883 to commemorate the coronation of Tsar Alexander III, which took place in Moscow on May 15, 1883 at the Uspensky Cathedral. 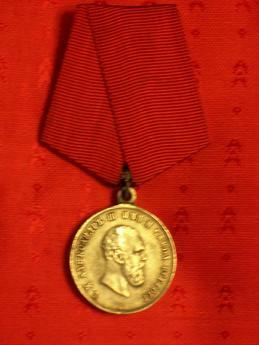 The Medal was awarded to persons of all ranks, military or civilian, who took active part in the ceremonies of the coronation. The obverse of the silver medal shows the truncated bust of Tsar Alexander III, facing right. The circumscription means: "By the Grace of God Alexander III Emperor and Autocrat of All Russias". 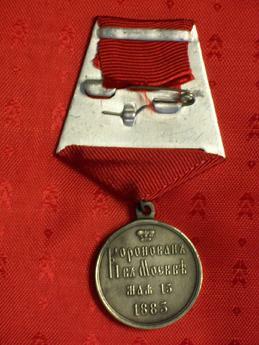 The reverse of the medal is plain, except for the inscription meaning: "Crowned in Moscow on May 15, 1883".